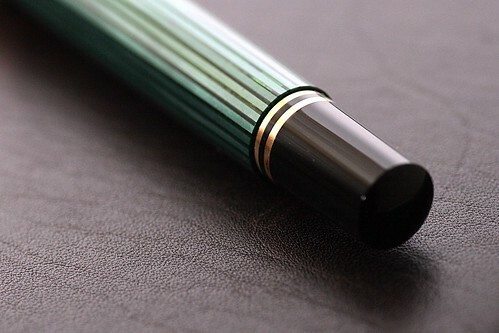 This is a brief review of the Pelikan M650 fountain pen with green striped barrel. 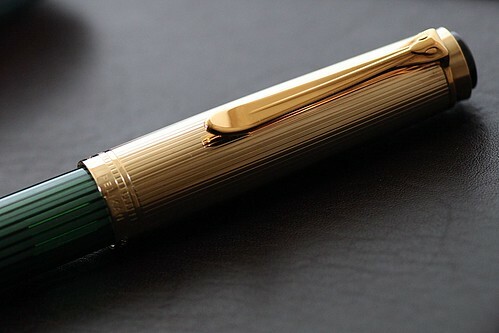 The Pelikan M650 is a discontinued model from Pelikan’s Souveran family of fountain pens. It has been out of production for a few years already but once in a while new old stock may be found on offer. 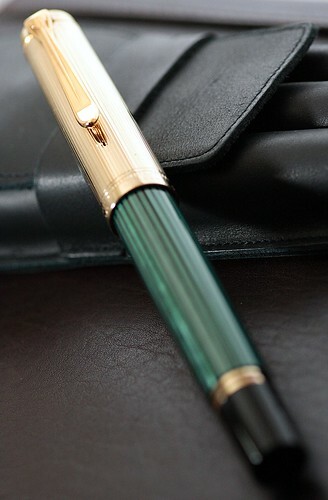 Such was my good fortune when I stumbled across the green striped M650 on sale at one of the pen retailers in Singapore. I was doubly lucky to have purchased it at a very substantial discount. Being a member of the Souveran family, the M650 shares the same distinctive look which is the trademark of Pelikan’s flagship range of fountain pens. 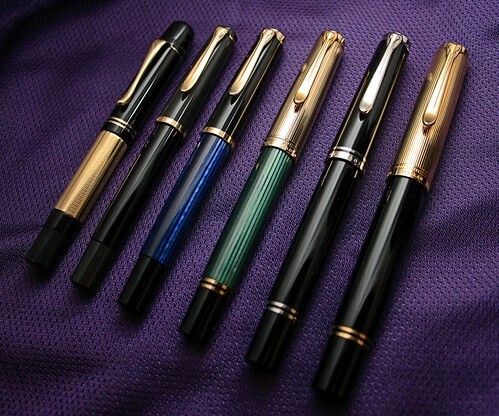 As can be seen from the comparison photo above, the M650 is the midsize member of Pelikan’s fountain pen range. It shares the same barrel size as the M600 pens and has the additional feature of a vermeil cap, ie gold plating over sterling silver. The distinctive double band at the end of the barrel. The M650 was originally offered in a variety of barrel designs. My pen came with the green and black stripes. The barrel is translucent, which allows the ink level to be seen easily when held against the light. At the end of the barrel is the piston fill knob which is decorated with the distinctive double gold band. The vermeil cap has the Pelikan logo embossed (silkscreen?) on top. Engraved on the cap is the number 925 which indicating a silver content of 92.5%. 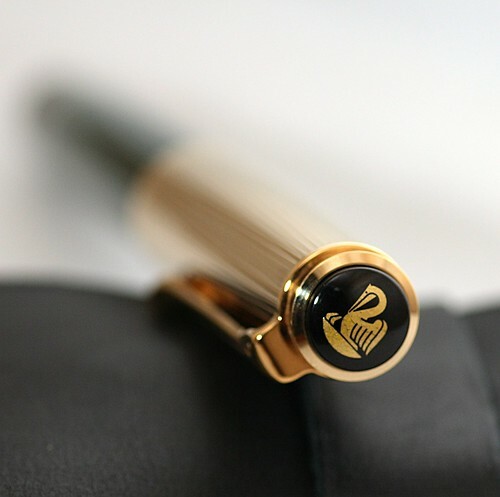 The clip bears the trademark Pelikan beak design. The pen has a total length of 134 mm. The barrel is 103 mm long while its cap has a length of 62 mm. The barrel width is approximately 12 mm. When posted the total length is approx 154 mm. The pen weighs 22.5 grams, slightly heavier than the M600 which tips the scale at approx 17.6 grams. This is of course due to the heavier cap made of sterling silver. single turn. A very convenient feature during daily use. The finely engraved and beautiful two tone 18K nib. The Pelikan M650 is designed to take on interchangeable nibs (ie the nib is interchangeable amongst the M600 range of pens). My pen came with the 18K solid gold fine nib. It is two toned and beautifully hand engraved. The nib writes very well, laying down a fine wet line with the smoothness which is typical of Pelikan fountain pen nibs. As can be expected the M650 is equipped with Pelikan’s excellent differential piston fill system. With the piston filling mechanism, the barrel acts as the ink reservoir and the pen is able to hold a substantial amount of ink. The M650 comes with the exquisite vermeil cap, Pelikan’s famous differential piston filling system, and the very fine 18K solid gold nib. At the price which I paid for this pen, it definitely represents excellent value for money. To summarise: On its own, the Pelikan M650 is a fountain pen with a distinguished pedigree, has a well proven design, quality construction and impeccable finish. That alone is a good enough reason to get the pen. 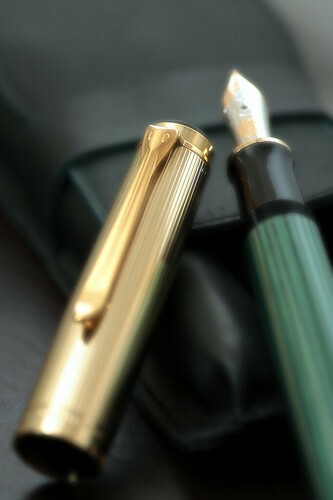 The fact that the Pelikan M650 is now out of production makes it all the more collectible. The Pelikan M650 is a worthwhile addition to any fountain pen collection. Thanks Chris. Glad you found it interesting. Just like to know how much you paid for it. I can’t recall the exact price that I paid for it but I do remember that it was a bargain which I picked up in Singapore. In your comment, you mentioned the black coloured model. I assume that you are referring to the M600 with green pin striped barrel. The asking price of S$299 is reasonable. i have read many good review about pelikan fountain pen.. i tried tasting on a M600 in a bookshop the other day. The weight and the grip of the pen feel perfect but the nib don;t feel smooth when i write on it. Is that what happens with new pen. Do i have to buy it use it for sometime and wait for it to get more season before it will write smoothly? If the nib feels rough or “toothy”, it’s likely that the nib tines are misaligned. Chances are the nib has been “damaged” by too many customers testing out the pen. I would suggest that you purchase the pen through a specialist dealer such as Pengallery located at the Weld. They not only have a much wider selection of pens, they also take excellent care of their products. Thanks for your suggestion. 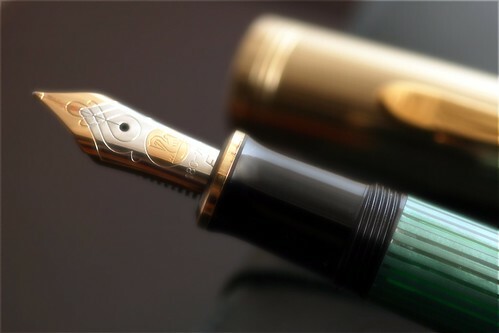 Is it possible for me to buy that pelikan pen and go to someone to aligne it? as that shop is offering a really good price for M600. You can certainly acquire the M600 first and either send it in for service under warranty or you can get it fixed by the local pen doctor at KS Gills, Jalan Tunku Abdul Rahman. There’s a resident FP expert who can fix the problem within 5 minutes for you.